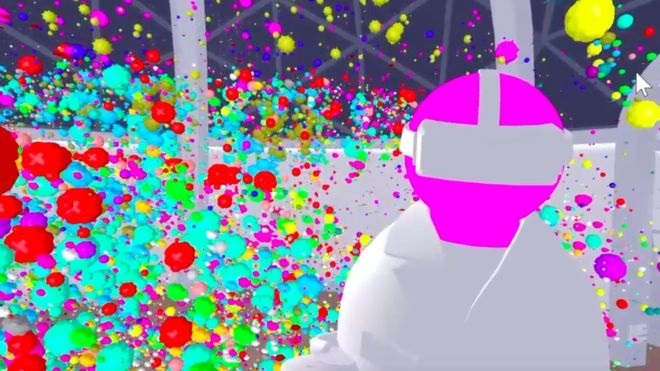 Scientists in Cambridge have built a virtual reality (VR) 3D model of cancer, providing a new way to look at the disease. Prof Greg Hannon, director of Cancer Research UK Cambridge Institute (CRUK), told the BBC: "No-one has examined the geography of a tumour in this level of detail before; it is a new way of looking at cancer." The 'virtual tumour' project is part of CRUK's Grand Challenge Awards. Within a 'virtual' laboratory, Prof Hannon and I became avatars, whilst the cancer was represented by a multi-coloured mass of bubbles. To explore the tumour in more detail, the VR system allowed us to 'fly through' the cells. As Prof Hannon rotated the model, he pointed to a group of cells that were flying off from the main group: "Here you can see some tumour cells which have escaped from the duct. "This may be the point at which the cancer spread to surrounding tissue - and became really dangerous - examining the tumour in 3D allows us to capture this moment." Prof Karen Vousden, CRUK's chief scientist, runs a lab at the Francis Crick Institute in London which examines how specific genes help protect us from cancer, and what happens when they go wrong. She told the BBC: "Understanding how cancer cells interact with each other and with healthy tissue is critical if we are going to develop new therapies - looking at tumours using this new system is so much more dynamic than the static 2D versions we are used to."